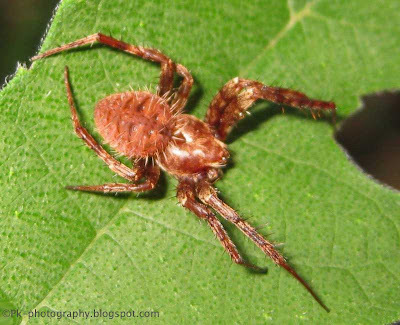 The Ghost Spider (Neoscona punctigera) is a brown colored species of orb-weaver spiders in the family Araneidae. 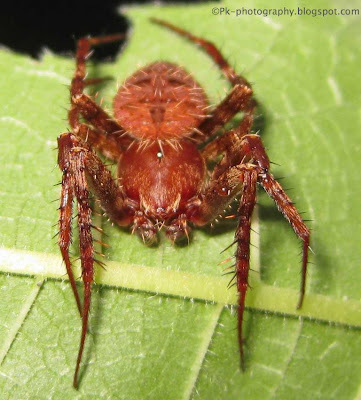 It has a hairy body and its legs are covered with spines. It's a nocturnal species. It constructs its web at night, shortly after sunset and removes the web next morning. During the day, it hides among the leaves. When at rest, it assumes a shape that looks like a monkey (first Pic) and that's why it is also known as "monkey spider"
You have captured a very special spider !!!!!!!!!!!!! Congratulations. It is amazing how many hairs these spiders have! Hello, So nice this is a beautiful pic. Hi, Wonderful picture i like that. Hahaha, Birdy, you have shown us its best profile photo. If you just showed us the last one, we will not know how the name arise. I havent seen it, i'm sure! 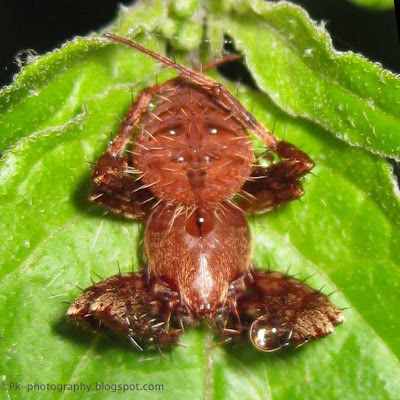 Please look at my newest post for the proper ID of my moth. Thank you.